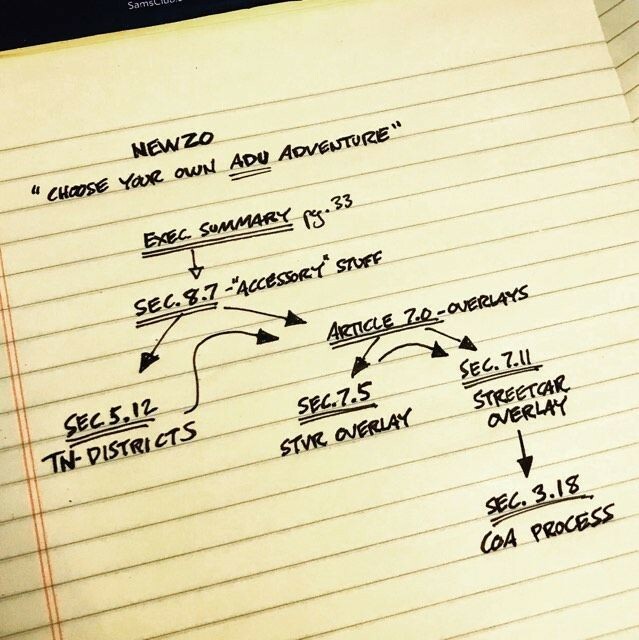 FIRST, a confession: I have not read all of the current draft of NewZO (titled "Final" — but we’ll see). However, I do have all of it printed out and in a binder on my desk, and I will probably, eventually, read all of it. Or at least skim it. Sane citizens will not be interested in reading through the whole thing. 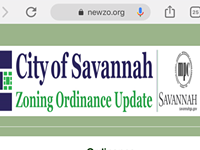 So, let’s take a quick look at NewZO (www.newzo.org ) as most Savannah citizens might — using it to figure out how to achieve a particular outcome. Here’s a hypothetical: let’s say I’m a renter looking to buy my first house, and I’ve been looking into “house-hacking” on BiggerPockets.com. Typically, this means finding a way to rent out part of the property that is my primary residence, in order to stretch my buying power, or just to lower my cost of living. In this hypothetical, I’ve decided an Accessory Dwelling Unit (ADU, defined below) is the way I want to go. So, I want to find a property that already has an ADU, or where I’ll be allowed to build one. Actually, the idea of building one new appeals to me. In the case of ADUs, I’m lucky. At the bottom of the Contents page of NewZO’s Executive Summary, there it is, conspicuously: “Accessory Dwellings... 33”. So, this should hopefully tell me how the treatment of ADUs might have changed between zoning codes. NewZO provides new flexibility for developers and property owners to construct accessory dwelling units — ADUs (also known as garage apartments or carriage houses). • ADUs are limited to 400-600 square feet and may contain no more than 1 bedroom. • Located 10 feet from the principal dwelling. • They must be built in an architectural style consistent with the principal dwelling. • They must share electrical and sewer service with the principal dwelling. The 200% standard does not apply in TC-, TN-, D-, and R-1 districts — collectively the more historic portions of the city — where ADUs are well-established as a common housing type. See 8.7.4 for further details. That doesn’t seem too onerous, at least not for the more historic portions of the city, which is where I want to buy anyway. This sub-section is a page long, and basically says the same thing about ADUs that the Executive Summary did, but in more detail. Where new information is to be found is a bit non-intuitive, having been directed straight to sub-section 8.7.4. The user needs to back up and read the section headers 8.7.1 —Purpose, and 8.7.2 — Generally. Another tip – always read section headers like this. More bread crumbs — I’ll take them in order. First, I’ve decided on a target area: Thomas Square/Metropolitan. I like what’s happening here, and I think I’ve heard that I’m allowed to have a short-term vacation rental (STVR) in my ADU. Both tell me to go back to Sec. 8.7. No news is good news — there seem to be no exceptions attached to this zoning district in regards to ADUs that I need to worry about. However, the next bread crumb points me towards Article 7.0 — Overlays. Again, this part of the search is not so intuitive or clear. If I don’t know how to use the online map functions, turning overlays on and off, I basically have to skim Article 7.0 to see what overlays might apply. Sec. 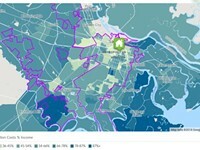 7.5 is the Short-term Vacation Rental Overlay District. Yes, I’m definitely interested in this. 7.5.6 tells me that in the TN-2 district, I can use an ADU as an STVR, as long as I own and live in the primary dwelling unit, and as long as I’m inside the Streetcar Historic Overlay District. Cool — another bread crumb. Sec. 7.11 is that Streetcar Historic Overlay District. From the included map I see that this newly named overlay (basically taking the place of “MidCity” and bringing it into geographical conformity with the Thomas Square Streetcar National Historic District) is right where I already wanted to be. Awesome. I should probably read this whole section. Very importantly, sub-section 7.11.5 informs me that I might need a Certificate of Appropriateness (COA) “prior to the commencement of certain work” – like building an ADU perhaps? I am referred to Section 3.18 to find out. Yes, another bread crumb. Article 3.0 is Application and Review Procedures. And, yes – Sec. 3.18 “COA for Local Historic Districts and Local Historic Properties” tells me that I DO need a COA to build a new ADU in my target area. 3.18 also tells me how to get that COA. Seems to not be too arduous a process, as long as I don’t plan on my ADU straying from the surrounding architectural norms. That’s it. I’ve found all the info in NewZO needed to assure I find a property that suites my “house-hacking” plans. It was a little bit of a journey, but I deliberately added complicating factors like a historic district and STVR considerations. Printing out everything in NewZO that I thought was directly applicable to this “ADU hunt,” I came away with 38 pages of material. Like a choose-your-own-adventure, I hopped back and forth between articles and sections, but the instructions about where to go to next were fairly clear. I didn’t get lost, but then again I’m also already fairly comfortable with a zoning code. This is “a cloud-based code publishing and content management system” that the City plans to employ concurrent with the adoption of NewZO. The service promises to provide online tools that will make the search I did above basically automatic – plug in an address or a term like “ADU”, and it will bring up all sections of NewZO that are applicable. Good stuff. By the way, I chose an “ADU hunt” as my hypothetical because I believe that ADUs are very important. They are an organic and traditional way to increase housing stock and affordability, both for the owner of the primary dwelling, and the renter of the modest ADU. The City should be doing whatever it can to promote their proliferation. Therefore, I humbly suggest to MPC and City staff that before NewZO is adopted, please remove the requirement that ADUs not have their own electric meter. I say this as a fairly experienced landlord. I’d rather the tenant see and pay that highly variable bill, and have an incentive to conserve, than for it to be included in the rent. Back to NewZO itself. Number one: NewZO is definitely better organized and easier to use than the code the City has been agglomerating onto since 1960. Over and over, the Executive Summary points out how NewZO has brought increased simplicity and clarity, and that these qualities will bring increased understanding and predictability for the user. I believe this to be true. It’s still not a simple document, but it’s a huge improvement. Second, as demonstrated with ADUs, there has been a general reconsideration of what uses might be appropriate in what districts. Generally, NewZO is a bit more permissive. Will this help manufacturing start-ups to get going? It should certainly make it easier. Increased permissiveness and clarity should lead to a decrease in the need for variances and text amendments. And when accommodation is needed for larger projects (rather than adjustments for little things), NewZO has created a new standard for Planned Developments (PDs). Let’s just call this what it is. It’s “negotiated zoning.” I think it’s better to be honest about it than to obfuscate that fact. No zoning code can anticipate everything. For special projects there should be special exceptions. The good thing about a PD is that it “quarantines” the exceptions. 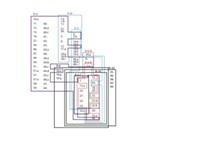 They do not become a part of the larger code, as they would with a text amendment. They stay with the individual project, wrapped up in a PD bow. 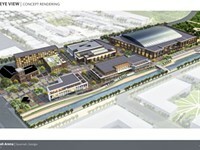 There’s plenty more I’d like to point out in NewZO — reduction of nonconformities, easier ways to meet parking requirements, codified neighborhood engagement, mixed-use allowed by right in commercial districts, a new Historic Preservation Commission for areas outside the Landmark District — and maybe I will in another column. OR, you could just read the Executive Summary for yourself! Let me say this:It’s not perfect, but it is a hell of an improvement. I urge readers to support the long-awaited passage of NewZO!! (As long as they get rid of that separate electric meter thing for ADUs). Let’s back up a second. That word. “Affordable” – what does that really mean?